How many times have you heard a claim like "our city centre needs more parking"? I hear it again and again in cities with a conventional approach to parking policy. Take Hamilton* in Ontario, Canada. Its policy makers seem keen on more downtown parking supply even when, by their own reckoning, a parking shortage is way off in the future! This post will focus on Hamilton but this same issue is a live one in thousands of cities all over the world. So even if you are not from Hamilton, read on! I really wish more cities would at least consider other questions first. Questions such as, is that parking problem really a shortage problem? Or, could price adjustments help here? Could travel demand management? Are there solutions that are more cost-effective than building more parking? And, is more city-centre parking really in line with our city's vision for the future? Anyway, let's get back to Hamilton. new commercial and residential construction in the downtown core over the past decade has led to a potential shortage of parking in the future, and a parking garage with 500 spaces would help alleviate those parking pressures. This is the news item's words not the actual report. But it would be telling about their thinking if the report frames the issue as 'shortage' with no mention of the potential to modify demand or to see upward pressure on market prices. There's no urgent need right now. We're just planning for the future and the potential shortage we'll face. 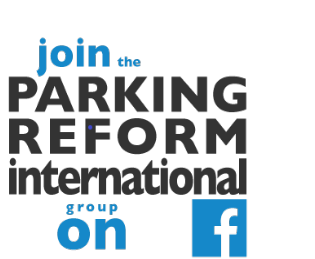 There are currently 13,109 spaces available for public parking in the area bordered by Cannon Street to the north, Queen Street to the west, Wellington Street to the east and Hunter Street to the south ... The report found that the peak time for parking in Hamilton is 11 a.m., when 68 per cent of spaces are utilized. It looks like there is actually considerable spare parking capacity in the area! ... And downtown intersections at King and Bay Streets and King William and John Streets were singled out as particularly 'high demand parking areas'. Parking in those two areas regularly exceeds 85 per cent, and the report suggests that the garage should be built near one of those locations. OK. So let's take a look at these specific problem locations using google maps. Here is the area around John and King William in Hamilton. Lots of surface parking. The King and Bay Streets area in Hamilton. More surface parking. Here is the google street view southwards along Bay St from its intersection with King. 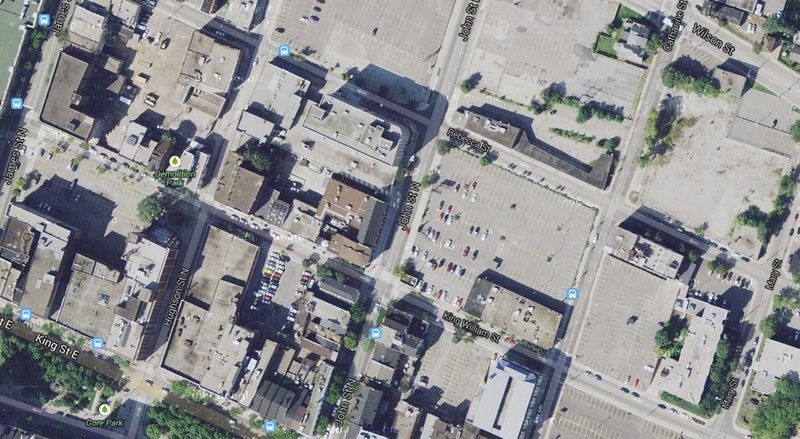 Is more parking supply really the best Hamilton can think of for improving these downtown places? They seem already to be mostly open lot parking. To have a vibrant area, you need parking. Not 100 per cent of the people headed to the core will walk, or take a bus or ride a bike. Wow. What a comment. It sounds like he has already decided the supply option is the right one. Is more parking really going to make such parking-dominated locations any more vibrant? And suggesting that opponents of extra supply need '100 per cent' of people to shift to other modes is a nice easy straw man to knock down. He is wrong to pooh-pooh the potential for reducing parking demand. Of course, not everyone will change modes. But SOME will, even in a place like Hamilton, even with relatively mild and moderate parking policy changes. And anyway, he is making the false assumption that managing parking demand is only about shifting people to 'walk, or take the bus or ride a bike'. In fact, managing and pricing parking is ALSO about nudging parking demand around in other ways that do not necessarily involve a shift in mode choices. For example, what could we expect in Hamilton's problem areas if Performance Pricing were tried. Some motorists would park for slightly less time, increasing turnover. Some would park a little further from their destination, easing pressure on those problem spots. Valet options might emerge. Some will share a car rather than have each member of a group drive separately to a meeting or lunch. Some employees will choose off-street facilities rather than shifting their cars around in the streets. To achieve at least some reduction in parking demand, we don't actually need to shift anyone to other modes or reduce total demand for trips in cars. Of course, mode shifts would also help but they are just part of the story. So has Hamilton already maxed out on parking pricing and management? Has it done everything else it could cost-efficiently do so that more parking supply is the only option? Let's take a superficial little look at some of Hamilton's downtown parking management features as highlighted on their website. Parking meter rates are C$1.00 per hour. The average daily rate in Hamilton municipal car parks is C$5.58 compared to the Canadian average of C$13.77. There are several municipal car parks with rates as low as C$0.50 per hour. There are several car parks with a Daily Rate of only C$4.00. There is FREE on-street parking from November 24th to December 24th. Hmm. This does NOT look to me like a city that has exhausted its other parking policy options, such as pricing and other management tools. It sounds to me like a city centre stuck in a rut of conventional parking policy assumptions. Expanding supply seems to be the first tool they are reaching for. Now I have never been to Hamilton or its downtown. In fact, in my adult life I haven't been to Canada. But based on the information I see here, it seem obvious to me that Hamilton should give more intensive management and pricing of parking a try before resorting to building extra parking. Does all this sound familiar from your city? * In case you are wondering, Hamilton is the core of a metropolitan area of 0.75 million. It is near Toronto and can be considered part of the Greater Toronto and Hamilton Area of more than 6 million people. I didn't see it when I was writing this item yesterday, but the Hamilton blog "Raise the Hammer" is onto this issue too. See http://raisethehammer.org/article/1952/live_and_dont_learn_downtown_parking_edition where Nicholas Kevlahan writes "It seems the City of Hamilton is living in some parallel parking universe (sorry about the bad pun) with its new Downtown Parking study. The City of Hamilton, or at least the MMM Group, seems not to have absorbed any of the lessons we have learned about how choices about parking supply and management affect behaviour, land use and the economy - especially in downtowns..."
I'm surprised but also very interested to see this post about Hamilton, living as I now do Mississauga, a city of 0.8 million just to the west of Toronto. While Mississauga is a former suburb (really a collection of bedroom communities, transit suburbs and crossroads towns), Hamilton is a very old and established city with significant industry. At one time (well over 100 years ago) Hamilton was actually a more important city than Toronto. Hamilton has gone through 40 years of losing its distinct identity and becoming a distant suburb of Toronto, but is poised to become a growing city once again as redevelopment and new development arrives in the city, along with improved transit and transportation. The Ontario government has recently announced a plan to bring all day commuter rail (GO Transit) service to the south side of Lake Ontario that would connect Niagara Falls and Hamilton to Toronto by 2015. Hamilton already has GO train and GO bus service but train trips are limited by physical constraints. Beyond that, Hamilton has its proposed BLAST rapid transit network, http://en.m.wikipedia.org/wiki/BLAST_network which will see the B-line LRT and A-Line RT built "within 15 years" once a funding plan is put together. With all that investment, I really have to wonder why anyone would fear a parking shortage coming to Hamilton anytime soon. What is really happening here is that the perception of vast and available parking, with easy access to one's destination ... is more important than the actual number of parking spaces available. Hence planners feel that they must maintain the illusion of visible and available parking despite this no longer being necessary or important. Thanks for this useful background information, Moaz. And good to hear from you! And guess who did the study. A company that, wait for it, builds parking structures! I see that the Parking Today blog has commented on this post. Thanks John!